The question of “designing flows” is pertinent today because the reality of living and working in a networked world is catching up with us. This new reality is catching up with us because being connected and increasingly dependent upon flows of useful information is having a rapidly growing (and deepening) impact upon the way(s) we do things. We are now connected to and surrounded by flows of information, and we need to be able to understand ..
3) how to be effective in these new conditions – individually, in small groups-of-purpose and (eventually) as general participants (citizens) in a networked society of constant information flows. It is as if we are discovering a new continent, new lands. Connected flows of information and motivation are completely new conditions, when considered as applicable to a large percentage of the planet’s people. For many generations now we have lived and worked in social arrangements that are hierarchical. Knowledge is power, it is said. Social hierarchy is directly related to that maxim. In virtually all areas of human endeavour, access to and possession of critical information and knowledge is essential to having and using power. Formal hierarchies guarantee that the occupants of the highest positions, those with power, have access to the most sensitive and critical element of knowledge. Thus, today’s acceptance of social hierarchy has grown through the ages out of the power structures of clans and tribes, which are typically directly related to the wisdom, sagacity and potency of a clan chief or tribal leader. It has grown and become somewhat normalized through the Middle Ages, the Renaissance, the Enlightenment, the Industrial Revolution and the Post-Industrial Information / Knowledge Era. As these eras have waxed and waned, the distribution and use of ‘knowledge as power’ has always been at the centre of social hierarchy (and now in the modern era, organizational hierarchy). The seminal moment or event for many arrived with the Gutenberg printing press, which brought a major new dimension to the notion that “knowledge is power”. It enabled the much easier, less expensive, more rapid and eventually decentralized creation and production of pamphlets and books, which in turn resulted in a much more widespread access to information, opinion and knowledge. However, its impact on the dissemination of knowledge throughout society was much resisted by the existing power structures (monarchies and the dominant church(es)) and occurred relatively slowly over several hundred years. More recently, and for a range of reasons we understand well, our modern era has codified and embedded hierarchy as the primary organizing principle for the protocols and methods that inform the institutions and dynamics of developed society. The dominance of hierarchy is primarily due to the wholesale adoption of Taylorism as a key model or orientation for a wide range of human activities (it being a model positing efficiency as a primary objective of organized activities). Taylorism met its soul mate in organizational hierarchy when the two core assumptions of 1) the decomposition of activities into component actions and 2) the division of labour into sets of tasks fitted together to deliver predetermined (read “designed”) results were codified into methodologies for work and organizational design that create, reinforce and sustain the pyramidal hierarchy that today we know so well. Approximately 40 years ago the Internet was created. A little less than 20 years ago the Web came into being, thanks to the invention of the graphical user interface (GUI). Subsequently, and with accelerating intensity, we’ve encountered and begun to use in massive ways hyperlinks, easy self-publishing tools and platforms upon which people connect, engage with each other and share. The past decade has been the beginning of an historic transition in how people communicate, use information and create and use knowledge. People everywhere are connecting, interacting and generating new loci of power based on sharing information pertinent to their purposes and interests. The now-ubiquitous hyperlinked social interaction creates an environment characterized by flows of information and a growing fluidity of activities. The relative stability and homogeneity of the pre-Internet post-WW II society is rapidly becoming a subject for wistful nostalgia for many. It seems clear that they are operating in, and fuelling social interaction with, connected flows of information and opinion. Social interaction generates information, opinion, beliefs – the basic exchanges upon which trust is built. ‘Traditional’ hierarchy needs to evolve in order to remain or become effective in such an environment of increasingly ubiquitous networked human activity. New conditions often demand new principles and ways of looking at things. Wirearchy is an emergent organizing principle that describes the fundamental dynamics supporting the interactions of networked people, technology and information. The working definition, which has become increasingly relevant over the past decade, is ..
Why the four elements of Knowledge, Trust, Credibility and a Focus on results ? From observations as the impact of hyperlinks and connectedness have spread throughout our societies, and a recognition during many conversations with many people, it seems that these four elements are at the core of why and how people will organize to get things down in an era characterized by growing flows of interconnected information. Let’s explore that affirmation in greater depth by digging into the role of each as 1) an enabler and 2) a practice that supports purposeful flows of information. Enabler: A foundation, fundamentally necessary. It represents the fundamental raw material applied to resolving a problem, deepening the understanding of an issue and the challenge and opportunities the issue presents, improving in tangible ways the value received from a product or service. Practice: It is available or built through exchanges between humans who are working on understanding who to do about a problem, issue, product, service, etc. Enabler: Essential for any meaningful exchange (other than conflict) between sentient beings. The infrastructure and operations of governance and law in a human society is a response to the fundamental need for trust. Practice: It is available from seeing and experiencing the result of exchanges between humans where those involved in the exchanges assess the veracity and applicability of knowledge generated by the exchanges. It is developed over time from each participant assessing for themselves the intent, style and subsequent effects or results of the exchanges between the human participants involved. Enabler: Assuming exchanges between humans are not always one-off or unique/singular each time but are ongoing (due to commonality of purpose and the nature of problems, issues and providing products and services to markets or communities), a desired degree of efficiency demands that it should not be necessary to build and deploy the necessary knowledge and trust each time humans address a problem, issue/opportunity, product or service. Practice: Exchanging with others visibly (i.e. working out loud) and demonstrating in accessible and tangible ways the knowledge that an individual brings to an / the exchange(s) can offer others the opportunity to assess knowledge and develop degrees/levels of trust over time. As experience with others grows over time in exchanges about a problem, issue/opportunity, product or service grows over time, credibility becomes 1) a threshold of assessment and 2) a facilitating dynamic for deepening and accelerating the relevant impact of applying trusted knowledge. It is an efficiency lever. Enabler: A networked environment in which flows of information from a large number of human participants with diverse interests, perspectives, beliefs and values results in conditions of complexity. In order for humans to make any constructive progress when addressing problems, issues/opportunities, products or services in conditions of complexity, it is essential that there is a common understanding of what is desired or required to be generated as a result of the exchanges between humans. A focus on results is the practical definition of a network’s purpose. Practice: In order to be effective with respect to addressing a problem, issue/opportunity, product or service, there must be a common understanding of what is the desired or required end state achieved by addressing them. 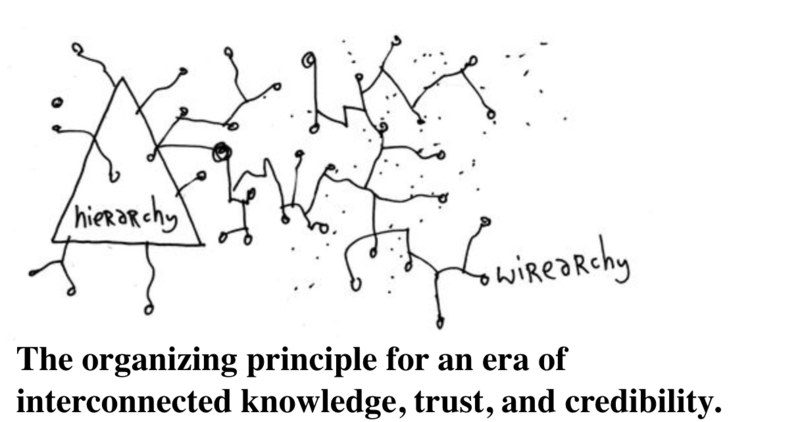 The initial exchanges between networked humans-on-purpose must seek to clarify the desired or required end state in order to provide intent and direction to the knowledge sought and applied, and in order for the combination(s) of knowledge, trust and credibility to have positive and tangible impact towards the desired or required end state. To deepen the introduction to the concept of wirearchy (which I argue is a fundamental evolution of hierarchy but in a “wired” networked environment), it’s useful to think of using X-rays to discover the effects of networked activity on the classic organizational hierarchy .. the infamous organization chart which maps out reporting relationships and structural lines of communication and decision-making. The X-ray images show what’s actually going on in terms of activities, making a visual map of the connections, sharing and dynamics of interconnected (hyperlinked) people and information. Basically, in an interconnected and hyperlinked world (the new conditions in which we live) flows of information increasingly define key aspects of what we do and how we live. These flows of information are occurring in a public space, and are beginning to be a key ingredient of communal, societal (and perhaps global) cultures. Can such flows be designed ? The short answer is yes, but probably not in the sense of a stable or necessarily repeatable form. In interconnected conditions we can design flows in the sense that the flow(s) address a purpose and its subsidiary objectives. The flows, whether of human energy, pertinent information, actionable knowledge, or other forms of stimuli and data can be directed towards and/or grouped around a purpose and the objectives that accompany or define the realization of that purpose. The working definition of wirearchy as an organizing principle comes into effect in such conditions. People grouped around a purpose and objectives (the thrivability of a community, let’s say) use knowledge, trust, credibility and a focus on what needs to get done in order to 1) clarify, 2) enable and 3) sustain the community’s thrivability. The form of organization taken by any given group will be based on its purpose and (increasingly) be designed by the people involved. It will use the flows of exchange to build trust through engagement and credibility, and it will use existing and just-in-time knowledge built by the participants (mined from the flows of information by the exchange(s) of pertinent and useful information to address the purpose and objectives of the group. Two recent examples come to mind come to mind that may help clarify how this use of connected flows in a network operates. The first demonstrates a small working group working on a clear and defined purpose that involves a complex issue, and the other sets out the results generated by three years’ of intentional and focused experimentation by a large commercial organization. Two colleagues who live thousands of kilometres from me have been working with me on developing a short but complex statement of philosophy and value generation to support the launch of a worldwide network of organisational change agents. Our working relationship and friendship has developed over the past 10 years (in one case) and five years (in the other case). We have grown to know each other well through reading each others’ work, commenting with both agreements and disagreements and exploring the foundations and meaning of each others’ positions. In 2013 the ISIA College of Art and Design in Florence, Italy was faced with important budget cuts that precipitated a crisis for its students and faculty. The impending crisis motivated a group of students who had been studying the design issues in the “Near Future of Education” to begin exploring and imagining how they could survive and evolve as a learning-and-practice design nexus. The initial realization is that a viable and thrivable future in an increasingly networked-and-digital world would most likely come from the students and faculty embracing greater responsibility for the college’s governance, administration and general learning dynamics. A group of students formed an exploration group and began researching possibilities, settling finally on the general vision and ethos of the P2P (peer-to-peer) and Commons movement as an orientation that they felt could provide a good foundation for a thrivable future. They set up a foundation to house the implementation of the eventual framework, called the Knowpen (knowledge + open) Foundation. They then began researching various approaches to governance and structure, including sociocracy, holocracy, Googlecracy, heterarchy, self-organizing systems and wirearchy. They also set up an organization called “NEFULA” (Near Future Education Lab) to offer practical approaches to design projects, art installations, etc. They eventually chose the framework of wirearchy as their key orientation to positive constructive change towards increased self-governance and self-management. The story of their process and the initial results of exploration and choices is summarized in this video on YouTube titled “Knowpen Foundation”. 3 years on, their choices have led to a thriving student body, a growing profile in the realm of design for NEFULA and greater confidence in their abilities with respect to self-governance and self-management of a high-profile educational program. They have embarked on building a continuously evolving human ecosystem. 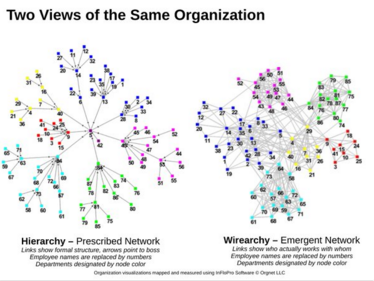 These new ubiquitously-interconnected conditions have brought us rather quickly to a deeper understanding that the principle of wirearchy helps people create and empower human ecosystems. These ecosystems will need to learn and practice how to use flow to accomplish what they decide to do, and to bring form, focus and function to thriving in the pursuit of the future they desire for their purposes. It does not happen by magic. It demands a clear and deep understanding that the new conditions described earlier in this piece are here to stay and will in all likelihood densify and intensify. In order to be effective in such an environment, humans operating on-purpose with each other in flows of digital information carried by an interconnected electronic infrastructure need an intelligent framework that respects the core dynamics of the social interactions that generate pertinent and actionable knowledge and creates tangible value for the ecosystems in which they work and live. I wonder how you assess our approach of converting what you call ‘Wierarchy’ in feasible enterprise structures. We call it ‘Agile Organization Models’ and consider ‘direct interaction’ of participants in multidimensional structures as an equivalent of your ‘flows in networks’. Depending on the unit size and the objectives to achieve we recommend implementation for B2E (intranet), B2B (extranet for providers and partners) and B2C (internet & CRM). For private pages even the graphical integration of contacts in Public Social Networks like LinkedIn and Twitter may be of use (B2C prospects). The easiest technical and secure integration can be realized in horizontal portals like Liferay or in other web based portal systems like MS Sharepoint, Salesforce or Adobe. May I ask you to let me know if and when you will use it in public presentations or in your consultancy.